Delta state police arrest man who kidnapped himself And Demanded Ransom From His Uncle. 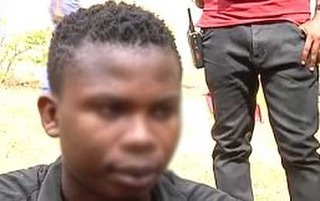 Justice Ifeanyi, 21, allegedly planned to kidnap himself with intent to extort money from his uncle. According to the Police, it was revealed that he planned his own kidnap and made a ransom demand of N4m to secure his release. Ifeanyi who was paraded at the state police command in Asaba yesterday, said he intended to use the money he would have extorted from his Uncle to complete his own father's house in Rivers state. He said he was apprehended while running away from his other accomplices who had started threatening him after his Uncle refused to pay the ransom. “I left Rivers for Delta state to plan my kidnap so that I can collect money from my uncle to complete my father’s house in the village. The gang began to threaten me when my uncle refused to pay the ransom so I had to run away."